Many people have one party treat that is their go-to creation for potlucks. And then, some people can never make up their mind. Whichever side of the fence one happens to fall on, the last thing anybody wants is to be restricted by equipment. When it comes to party treats, oftentimes that means getting the hors d’oeuvres to the party. (After all, there is a reason those crazy cake challenges on TV require the elaborate creations to be carried across the stage.) No matter what creation you’re inspired to bring, the Party Traveler Set can help you get it there. Featuring the ability to transport everything from dip to deviled eggs, the multi-tray carryall transports whatever party favorites you feel like bringing. Nesting together when not in use, the party accessory provides one less thing to worry about for weekend get-togethers. The ultimate traveling and serving tray. 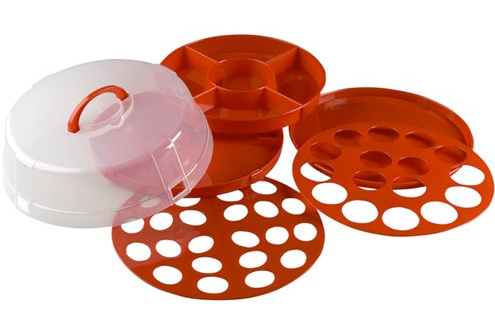 Party Traveler Set includes four trays and a handled lid that locks onto the sturdy base. Holds up to 16 Cupcakes, 24 Deviled Eggs, Snacks and Dips, Cookies, Brownies Cakes… the options are endless. Easily transports and displays any food or dessert for entertaining. Innovative tray design securely holds appetizers or desserts in place when carrying. All of the trays nest together inside main unit for compact storage.